SAN DIEGO, Aug. 29, 2018 /PRNewswire/ -- DISH and Independa, the global leader in remote engagement technologies, are transforming the way people interact with entertainment and healthcare services, whether at home or in senior living communities. Today at the Connected Health Summit, the companies announced that DISH's voice remote is now compatible with the Independa AnyTV Companion. When the Independa system is connected to a television installed with DISH's Wally receiver, users can easily control both their TV entertainment and Independa services with DISH's voice remote. 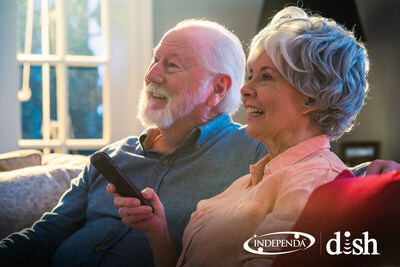 Launched in 2016, the Independa AnyTV Companion is a candy bar-sized set-back box that turns any TV with an HDMI connection into a bi-directional engagement platform for residential homes and organizations focused on senior living, home care, behavioral health and addiction recovery. With Independa's award-winning technology, users can schedule appointments, receive medication reminders, engage with others via video chat and messaging, and stay up-to-date on community information, like dining menus and event calendars, directly on their television. The platform is also compatible with health sensors and devices, like blood pressure monitors and scales, providing organizations and loved ones with a holistic view of the Independa user. "Television is the main source of entertainment and news for many older Americans," said Alistair Chatwin, vice president of DISH Business. "By combining the Independa system with our technology, we're turning the TV into a solution that delivers services to help provide a better quality of life, as well as operational efficiencies for organizations in senior care." "Independa and DISH are delivering an industry first, where a second remote is not needed for the operation of the Independa system," said Kian Saneii, founder and CEO of Independa. "Simplicity and ease of use are key factors here, and DISH customers can now enjoy all the benefits of an Independa system right on their TVs, without the need for a computer, tablet or smartphone. No passwords, no software updates – nothing new to learn." For more information, visit DISH's senior living page. Independa, Inc., is the global leader in remote engagement technologies. Founded in 2009, Independa helps people stay at their residence of choice longer, safer and more comfortably, delaying or even preventing the next episode or stage of care, while also increasing organizational effectiveness and operational efficiencies across the care continuum. Independa enables the best remote engagement and care by leveraging its award-winning software platform to integrate across the TV and other everyday devices, improving quality of life and quality of care while reducing operational costs. Visit www.independa.com.